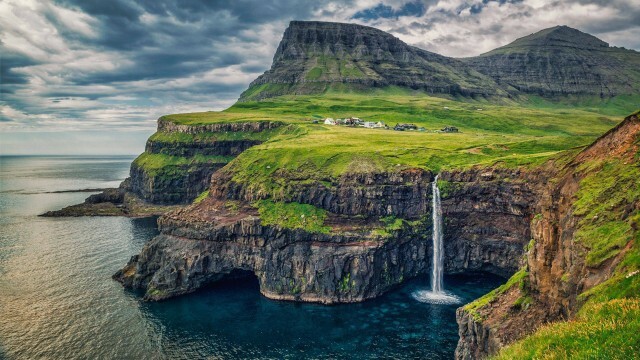 THE FAROE OR FAEROE Islands (Faerøerne in Danish, Farøyar in Faroese, meaning the “Sheep Islands”) are located at the intersection of the North ATLANTIC OCEAN and the Norwegian Sea, roughly equidistant between NORWAY, SCOTLAND, and ICELAND. Their closest neighbors are the Shetland Islands, 190 mi (305 km) to the southeast. Like the Shetlands, the Faroes were first encountered and settled in the 9th century by Norwegian Vikings, but while the Shetlands were eventually given to Scotland, the Faroes remained part of the Kingdom of Norway, until 1814, when Norway was ceded by DENMARK to SWEDEN. The Faroe Islands (along with ICELAND and GREENLAND) remained a possession of the Danish crown and were given powers of self-government in 1948. The group consists of 17 inhabited islands, including the main island of Streymoy (or Strømø in Danish) and one uninhabited island and islets. The other main islands are Eysturoy, Sandoy, Suderoy and Vágar. Altogether the coastline stretches 694 mi (1,117 km). The terrain is very rugged, with rocky peaks, and cliffs along most of the coast. Human habitation is thus limited mostly to narrow coastal lowlands. Although the islands are located very far north, the climate is surprisingly mild in the winters from the effects of the upper reaches of the GULF STREAM. Horses and sheep, for example, can winter in the open air. Summers are cool, and year-round skies are usually overcast, with an abundance of fog and wind. The soil is generally very thin, but some crops can grow, including modest amounts of barley, turnips, and potatoes. There are little to no trees, but abundant turf, which is used for fuel. By far, the biggest industry is fishing and fish processing, with subsidiary industrial activity in shipbuilding and construction. Sheep rearing and dairying supplement the island economy, along with traditional handicrafts and coarse woolen goods. The newest enterprise for the 21st century is the vigorous exploration for potential oil reserves in the seas around the islands. The Faeroe Islands decided not to enter the European Union with Denmark in 1974 and have resisted most development of tourism and potential oil resources. A referendum for independence from Denmark failed in 2001.